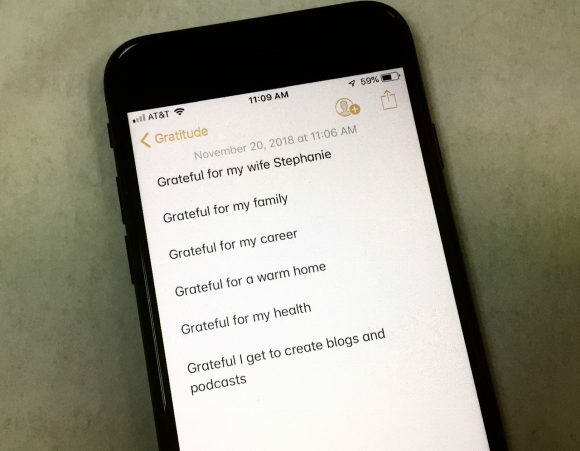 After getting a recommendation from many self-help books and podcasts I started making a gratitude list almost every morning since July of this year. Most of the time I write down 7-10 things into my iPhone. Often the lists repeat themselves with things like, “I’m grateful for my wife Stephanie, I’m grateful for my family, I’m grateful I woke up in a warm home, I’m grateful I am healthy enough to get out of bed, and I’m grateful I get to create blogs and podcasts and broadcast them to thousands of people.” I have found that when I make these lists I genuinely feel better throughout the day than if I had not done so. Right now I’m listening to a book by A.J. Jacobs, a favorite author of mine, called Thanks a Thousand. The book follows Jacobs in his quest to thank 1,000 people who contribute to his morning cup of coffee. He personally thanked the barista, the coffee farmers, the people from the water company, the people who build the skids to haul the coffee, the people who cut down the lumber that makes the paper for the coffee cups—you get the gist. Jacobs discovered that when he told people he was grateful for what they did he felt happier. In a podcast Jacobs quoted a Benedictine monk who said, “Happiness doesn’t lead to gratitude, gratitude leads to happiness.” It sounds paradoxical but studies by psychologists have shown this to be true. Studies have also shown that people who are the most grateful are those who help others the most. Maybe you feel crappy today. Maybe things are just not going well in your life right now. Consider making a gratitude list or just telling someone that you are grateful for them. You may be surprised how you feel afterward. I am thankful for Noah (my husband), my family, and my job. I am grateful for the air that I breath, the shoes on my feet, and the roof over my head. When I am in a funk, I give thanks for these 3 simple things. It tends to lift my depression and I can get out of bed, and go about my day without the negative mental chatter. Right now I’m grateful that I don’t have any pain, that I can usually feel peace inside myself whenever I slow down enough to take note of it, and that I like to help others. I’m grateful for my family & friends, I’m grateful we have chosen to share what we have, I’m grateful for forgiveness given and received. I will Say we are still blessed with some Freedoms and Liberty. Including the ability to express our thoughts, opinions and Blessings here. If you can attend a church meeting without fear of harassment, arrest, torture, or death … you are more blessed than three billion people in the world. If you can hold someone’s hand, hug them or even touch them on the shoulder … you are blessed because you can offer healing touch. If you can read this , you are more blessed than over two billion people in the world that cannot read at all. Noah, I am so grateful that I get to work with you. When the son teaches the father, and both can listen to one another and agree and disagree without rancor it is a blessing. I am grateful to belly laugh playing Scattagories with my family and getting skunked by my 13 year old Granddaughter. I am thankful to be alive and holding hands and hugging my wife often every day. What a gift. I’m grateful that the sun has made the back of my neck look like a pack of hotdogs. I’m thankful for the hug and kiss from my wife this morning. I’m thankful for 4 wheel drive that got me through 7 inches of snow this morning. I’m thankful for a God given healthy body.